Item #SS-2058: Handcrafted Indiri Collection Sterling Silver Bali beaded pendant with 8x10mm oval Almandite Garnet. Item #SS-2260: Handcrafted Indiri Collection Sterling Silver Beaded Bali drop earrings with 8x10mm oval Amber cabs and shepherd's hooks. Item #SS-1720: Handcrafted Indiri Collection Sterling Silver Earrings with two 9mm checkerboard faceted round Amethyst; Shepherd's hooks. Item #SS-1881: Handcrafted Indiri Collection Sterling Silver Earrings with two 5x7mm octagon Amethyst; Post backs. Item #SS-1883: Handcrafted Indiri Collection Sterling Silver Earrings with two 6x8mm oval Amethyst; Post backs. Item #SS-2114: Handcrafted Indiri Collection Sterling Silver earrings with two checkerboard faceted 10x12mm cushion Amethyst and kidney wires. Item #SS-1717: Handcrafted Indiri Collection Sterling Silver Pendant with 9mm checkerboard faceted round Amethyst. Item #SS-2057: Handcrafted Indiri Collection Sterling Silver Bali beaded earrings with two 6x8mm oval Almandite Garnet and shepherd's hooks. Item #SS-1553: 26mm round Handcrafted Indiri Collection Sterling Silver Bali Bola Earrings with Nailhead Design; Shepherd's hooks. 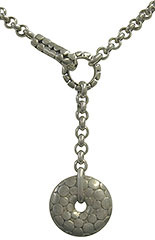 Item #SS-1715: 34mm round Handcrafted Indiri Collection Sterling Silver Bali Bola Pendant with Nailhead Design. 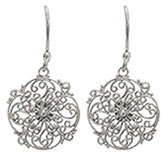 Item #SS-2053: Handcrafted Indiri Collection Sterling Silver Bali filigree earrings with lever backs. Item #SS-2056: Handcrafted Indiri Collection Sterling Silver Bali filigree earrings with two checkerboard faceted 9mm round Champagne Quartz and shepherd's hooks. 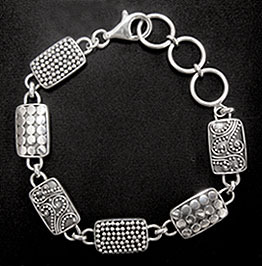 Item #SS-2052: Handcrafted Indiri Collection Sterling Silver Bali filigree pendant. Item #SS-2055: Handcrafted Indiri Collection Sterling Silver Bali filigree pendant with checkerboard faceted 9mm round Champagne Quartz. Item #SS-2134: 14mm round handcrafted Indiri Collection Sterling Silver Bali filigree earrings with shepherd's hooks. Item #SS-2265: Handcrafted Indiri Collection Sterling Silver Bali Fleur de Lis earrings with shepherd's hooks. Item #SS-1969: Handcrafted Indiri Collection Bali Half Dome Earrings; Post backs. Item #SS-2109: Handcrafted Indiri Collection Sterling Silver Bali earrings with two 8mm cushion faceted Black Onyx, granulation and lever backs. Item #SS-2111: Handcrafted Indiri Collection Sterling Silver Bali beaded pendant with checkerboard faceted 8x12mm oval Black Onyx. 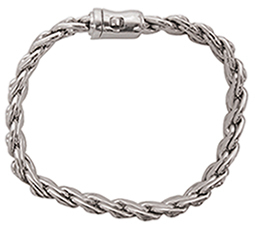 Item #SS-2262: Handcrafted Indiri Collection Sterling Silver & 18Kt. Gold Vermeil 9mm round Bola stud earrings with post backs. 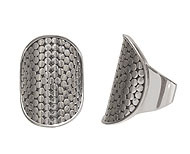 Item #SS-2261: Handcrafted Indiri Collection Sterling Silver 9mm round Bola stud earrings with post backs. Item #SS-1512: Handcrafted Indiri Collection 16mm Sterling Silver Filigree Dangle Earrings; Shepherd's hooks. Item #SS-1970: Handcrafted Indiri Collection 23mm Round Sterling Silver Filigree Dangle Earrings; Shepherd's hooks.